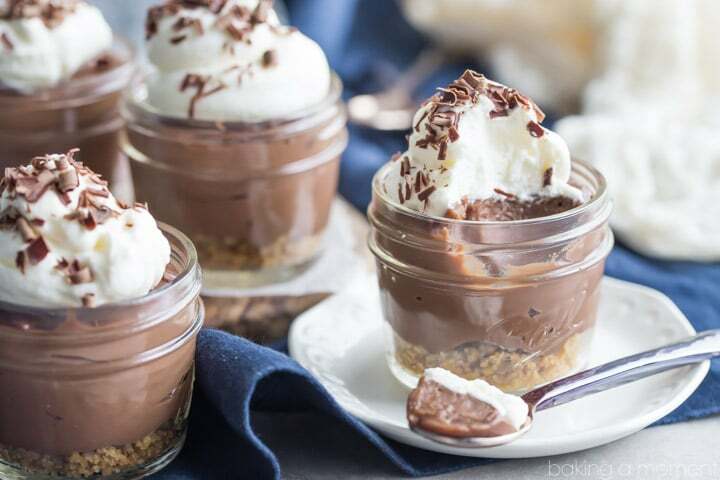 You won’t believe how easy these chocolate pudding pie jars are to make! With a buttery graham cracker crust, a smooth, rich, and intensely chocolate-y homemade pudding, and a crown of fluffy real whipped cream, you’ll never go back to store-bought after tasting this from-scratch recipe! Last week was a case of too many Father’s Day recipes and not enough time to share them all. I did manage to squeeze three in, but this one was still nagging at me. The good news is, this is a treat that’s never wrong. You can have it any time of year and it always makes perfect sense. I know it may seem kind of plain and not all that exciting, but my husband absolutely adores chocolate pudding pie. I’m talking store bought graham cracker crust, pudding from a boxed mix, and non-dairy whipped topping. I couldn’t let Father’s Day go by without indulging his craving. But don’t worry- I’m not telling you to make it like that. This is a thousand times better. We are taking something plain and unexciting, and making it WOW! It’s amazing how easy it is to make homemade pudding. For years I used the boxed stuff, without even thinking about it. Until one day my kids wanted pudding and we were fresh out. So I started throwing stuff in a pot and stirring it all together and boom. Pudding. It didn’t even take any longer to make than the mix. I actually think it might even be quicker. 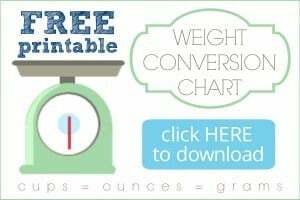 Ok so it takes a little longer to measure out the ingredients, but there’s ZERO wait time. It’s pudding before you even take it off the stove- no chilling required. Nice and smooth and thick and creamy, with a rich chocolate-y taste that will blow the other stuff right outta the water. Add that to a crunchy, buttery graham cracker crust and top it with a dollop of real whipped cream, and you have a classic treat that’s on a whole different level. Nothing plain about it! 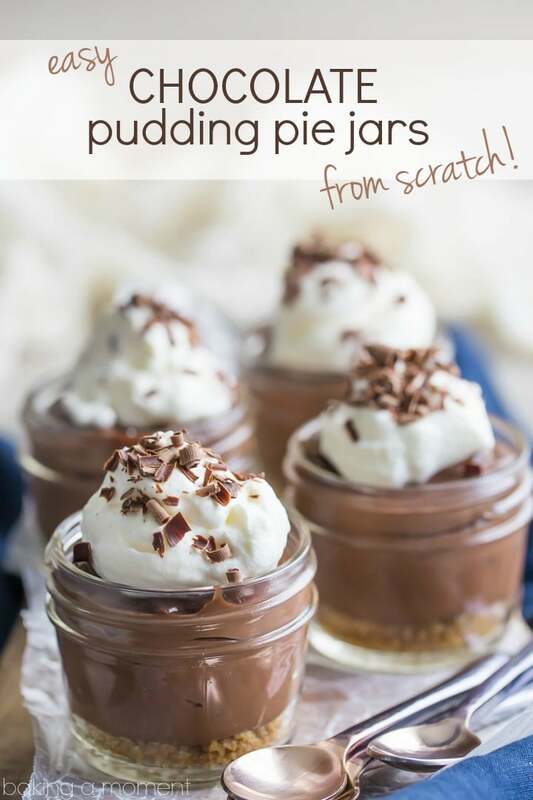 You won't believe how easy these chocolate pudding pie jars are to make! With a buttery graham cracker crust, a smooth, rich, and intensely chocolate-y homemade pudding, and a crown of fluffy real whipped cream, you'll never go back to store-bought after tasting this from-scratch recipe! 3/4 cups heavy cream, whipped to soft peaks with 1 tablespoon granulated sugar. Process the graham crackers in a food processor or mini-chopper until fine. Add the melted butter and toss together. Place about 1 1/2 tablespoons of the mixture in each of the bottoms of six 4-ounce jars. Place the sugar, cornstarch, and salt in a small pot and whisk to combine. Gradually pour in the milk, while whisking. Stir in the cream and add the butter. Heat over medium-high heat, whisking, until the mixture thickens and comes to a bubble. Turn off the heat and stir in the chocolate chips and vanilla extract. 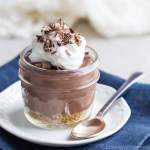 Spoon the pudding into the prepared jars, and top with whipped cream and chocolate curls. Everything from your kitchen is drool worthy but I’m always a sucker for homemade pudding. YUMMINESS! I love small desserts! I will give this a try, yummy! Looks delicious! Wish I had one of your jars here to taste i! Just whipped this dessert up with my 10 year old; added a pinch of espresso powder and a bit more chocolate chips for extra chocolate yumminess! LOVE home made pudding and this one is so quick to pull together. Do you have a quick recipe for butterscotch pudding? You can never post too many recipes for the men in our lives as far as I’m concerned, Allie! Plus, who doesn’t love chocolate… well aside from me, BUT I do LOVE it, I’m just allergic. So not sure if that counts. 😉 Anyways, these little jars are SO adorable!! Love that everything is homemade! 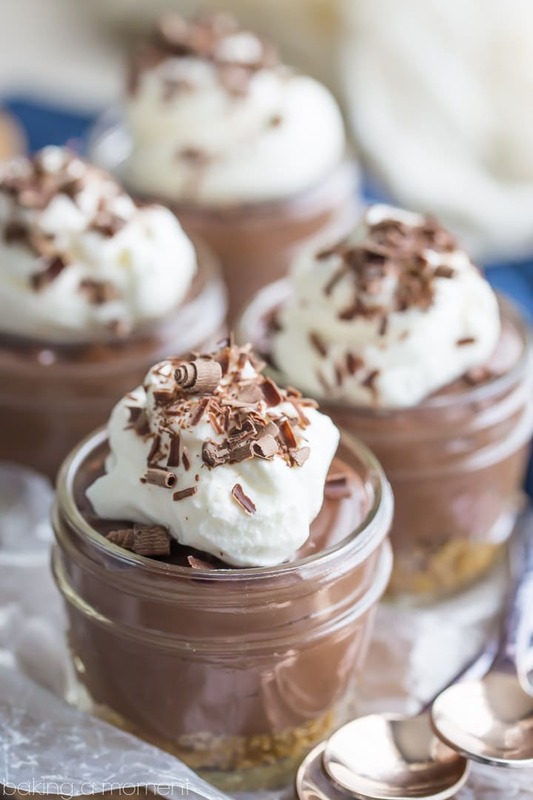 The hubster is a HUGE fan of chocolate pudding, so I must make these for him! Cheers, dear! Hope you guys had a wonderful Father’s Day weekend! This seriously screams summer! Love how thick and beautiful they are Allie! Homemade pudding ALL.THE.WAY!!! Love these and they look so cute in those little jars!! These little jars look just amazingly delicious. I know you are correct that homemade is always better that store bought. Is it possible to substitute 1/2 and 1/2 for the heavy cream? And can you make it a day ahead? You can definitely do that Cindy! I’ve done it and it works out great. And yes to making ahead too! Hope you enjoy! chocolate pudding pie is one of my faves too!! and I love how cute and portable and EASY and omgdeeeelicious these look! It’s such a classic right? And so comforting. Thank you so much Kayle I’m so happy you like this! Want to try this for a baby shower. Do you think if I made it a day ahead and then the next day scoop into smaller cups it’ll be fine? Yes I think so! Good luck!